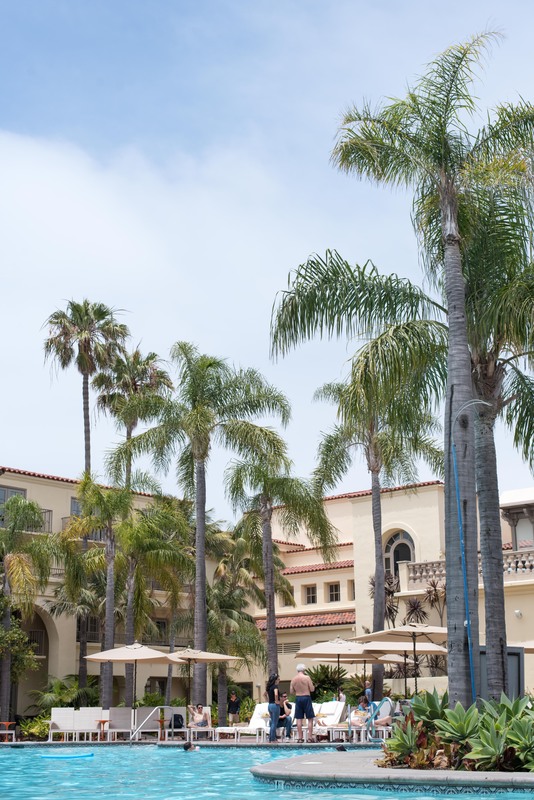 Over Memorial Day weekend, we celebrated our 7th wedding anniversary with a last minute trip to Southern California and my first ever stay at a Ritz-Carlton property. Luckily we were able to score a holiday reservation on Marriott points just 5 days in advance. 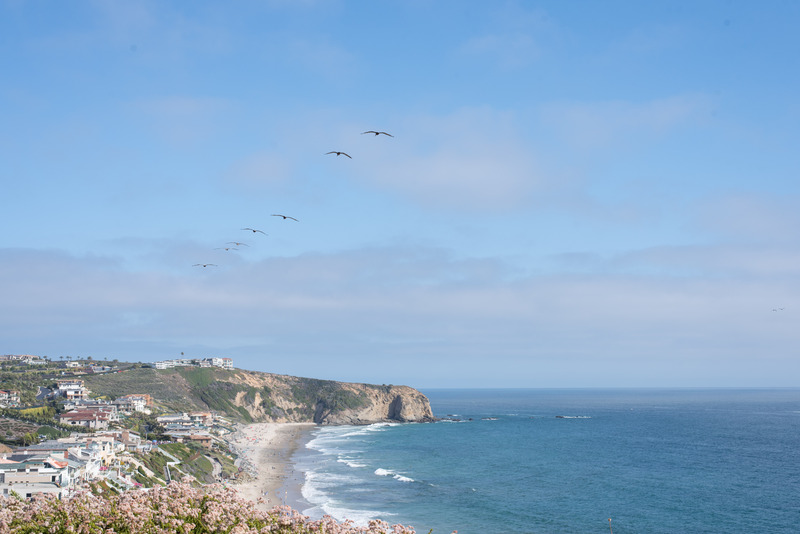 After a day in Los Angeles, we drove an hour down the coast to Dana Point in Orange County, which is about halfway between LA and San Diego. 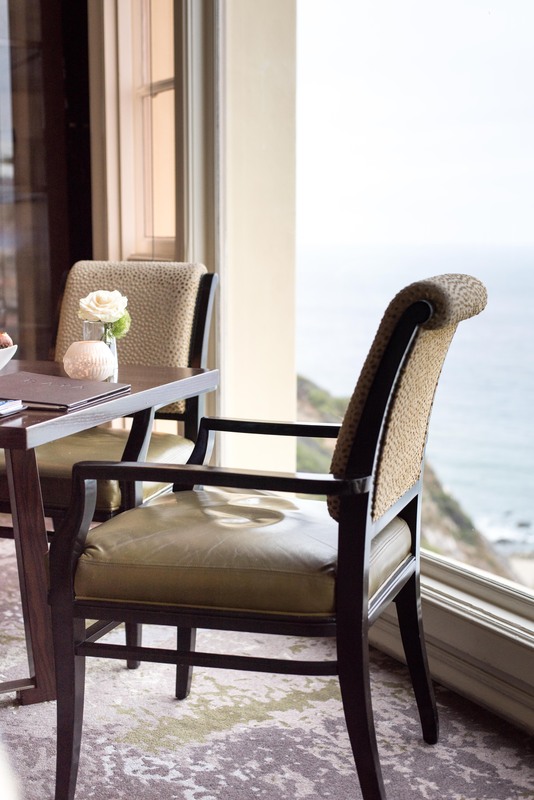 The Ritz-Carlton Laguna Niguel is situated on a dramatic stretch of California coastline that reminded me of the Italian Riviera. The sprawling property is perched above a wide beach dotted with umbrellas. The landscape is lush, the weather is ideal, and thoughtful details abound. With several restaurants and a plethora of activities onsite, we hardly left the property during our three night stay. From check in to check out, we were constantly impressed with the standard of service, making our anniversary as relaxing as it was memorable. I’m pleased to report that the reputation of the Ritz-Carlton brand totally lived up to my expectations… so much so that we already booked another Ritz property for December! Orange County’s John Wayne Airport (SNA), about a 25 minute drive to the resort. Long Beach Airport (LGB), about a 45 minute drive to the resort. For transcontinental or international flights, the most direct and least expensive options are typically to fly into LA or San Diego. The resort is about halfway in between the two cities. Rush hour traffic will make a huge impact on the travel time to the resort, so plan accordingly. San Diego International (SNA) is a 75 minute or more drive. Be aware of the toll roads leading into Orange County. They’re difficult to avoid, but it’s good to know ahead of time. See the maps and rates here. The hotel only offers valet parking, and it’s $40/day with unlimited in and out privileges. ALL YEAR LONG. But seriously, Southern California is always a good idea. We stayed in a second floor Garden/Pool Guestroom overlooking the main pool, in an interior courtyard. The decor is light and beachy (in the classiest of ways, of course), and the furniture is chic but comfortable. At 400 square feet, even the standard rooms are quite spacious. 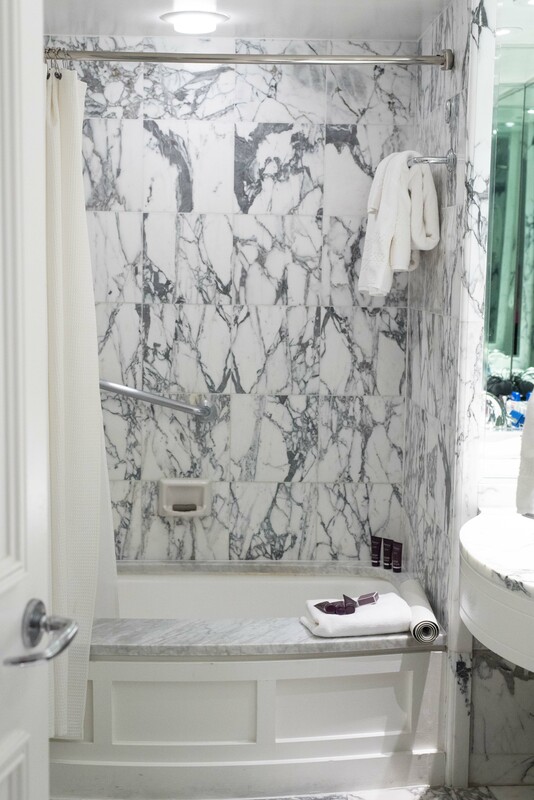 The marble bathroom and hallway closet both had everything we needed from a hairdryer to a iron and ironing board to a sewing kit and Asprey toiletries. I could live in one of their plush terrycloth robes. The complimentary overnight shoe shine service was a nice perk, too. 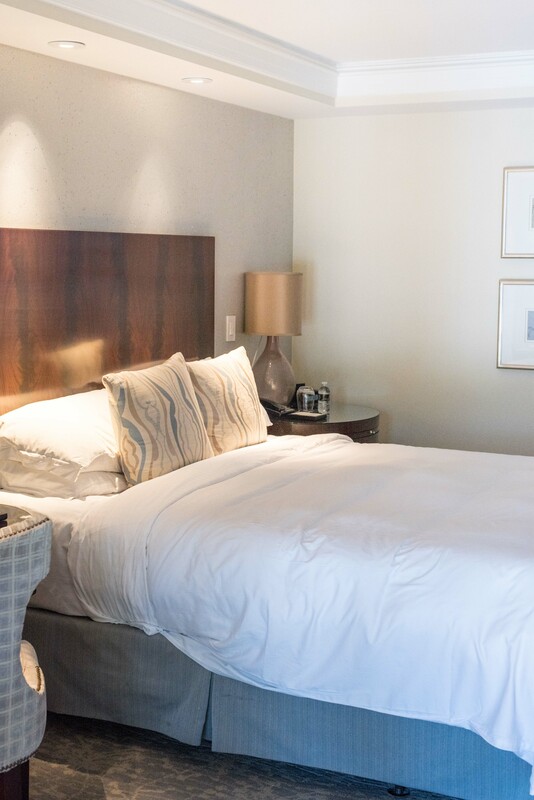 Some of the room’s features included coffee and tea service, a mini fridge, a desk, and a big, comfy chaise lounge at the end of the bed. After checking in, we ran off to check out the property since we had to wait for the bellman to drop off our bags from the valet. We were impressed to find a handwritten note from the bellman with our bags when we returned to the room. 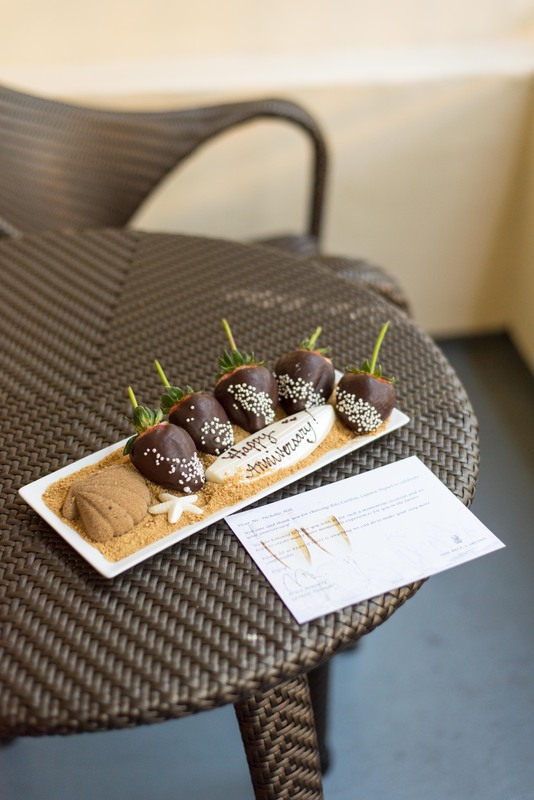 We were also greeted with an anniversary gift of chocolate covered strawberries on graham cracker “sand” with a white chocolate surfboard. It was a nice customized amenity that we certainly appreciated. However, in full disclosure, our original room was right across the hall from an old, very loud elevator that I could hear every time it moved. Fortunately the front desk offered to move us to another room without hesitation. While this minor frustration put a slight damper on our arrival, the wonderful service quickly made up for it. We ate at every restaurant in the resort except for the pool cafe, and there was plenty of variety to keep things interesting for 3 full days of meals. As you would expect from a Ritz property, the food isn’t cheap, but I was pretty blown away with the quality and creativity of the food. 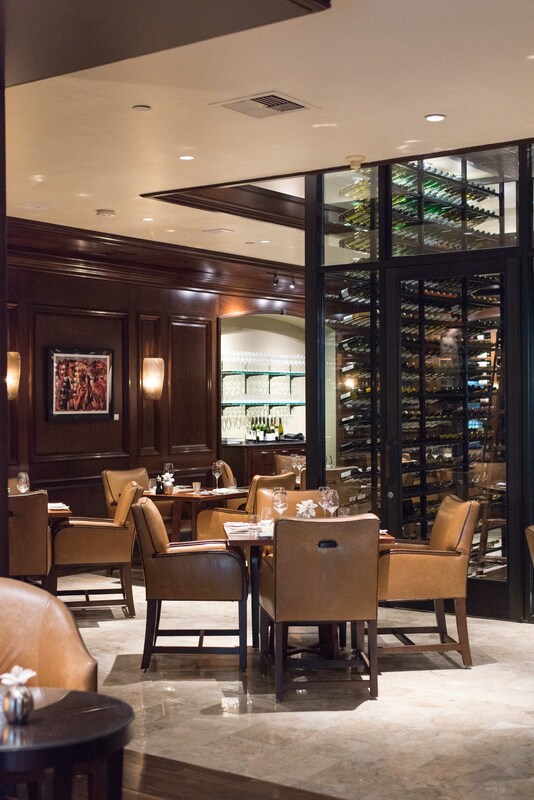 enoSTEAK – a contemporary steakhouse with creative, vegetable-driven appetizers and steaks cooked to perfection. 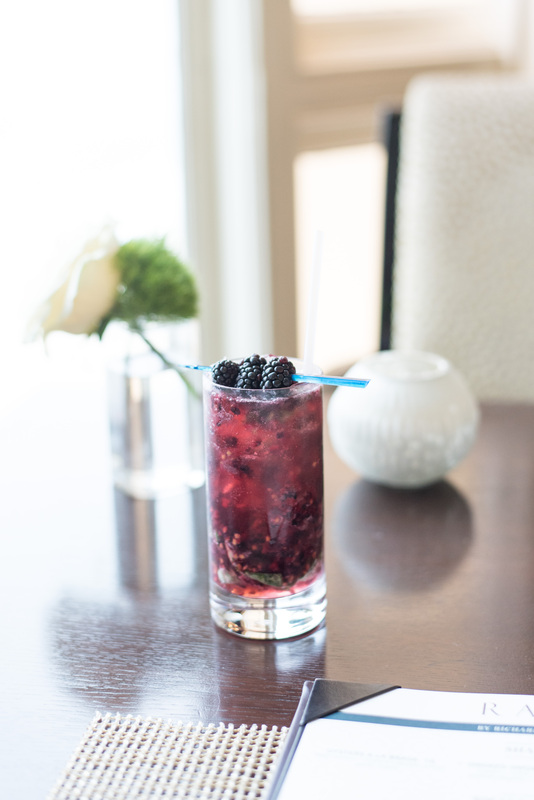 The prices are high, but the ambiance is great for an upscale date night. Raya – a Latin-inspired, locally-sourced restaurant serving breakfast, lunch, and dinner with panoramic ocean views. Don’t let the white table cloths fool you: the atmosphere is laid back and the service is friendly. 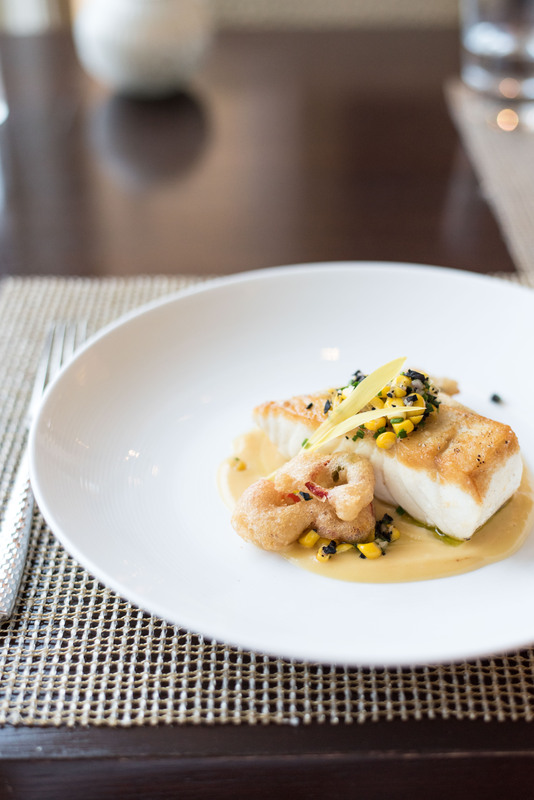 Get there early to snag a coveted window seat, and don’t miss out on the expertly prepared, sustainable seafood. Bar Raya – a lobby bar with ample seating and a small plates menu of appetizers, desserts, and late night food. No one will judge you if you pop in for a drink and some churros before dinner (like we did). 180blũ – an outdoor terrace overlooking the ocean serving the same menu as Bar Raya. They feature live music and sushi on Fridays and Saturdays. It’s perfect for watching the sunset dip beyond the sea, and heaters help make cool SoCal nights more pleasant. Don’t miss the popular tuna tartare bites. The Market Place – a surprisingly posh spot to grab coffee, breakfast, lunch, and snacks. The food is generally light and healthy–think smoothies, breakfast bowls, grain bowls, and salads–though the pastries and treats are worth a caloric splurge. The dishes are reasonably priced, which makes this a great counterbalance to the pricier restaurants at the resort. You can stay and eat at a hightop table or a loveseat, or you can get your food packaged to go. The Dana Pool Cafe – a casual cafe with seating by the main pool that also offers ordering from your pool chair. Think high-end pool food like sandwiches, salads, and appetizers with a gourmet flair. The hotel also offers an extensive in-room dining menu. 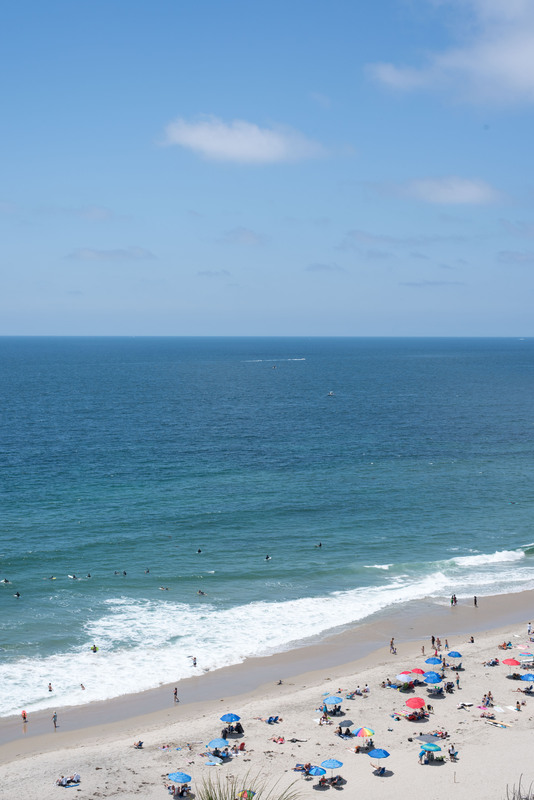 A trip down to the beach is a downright pleasant affair with the Ritz’s shuttle and beach butler service. The beach butlers have everything you need at the beach: towels, chairs, umbrellas, sand toys, sunscreen, and cold bottled water. The best part is that they’ll set it all up for you! 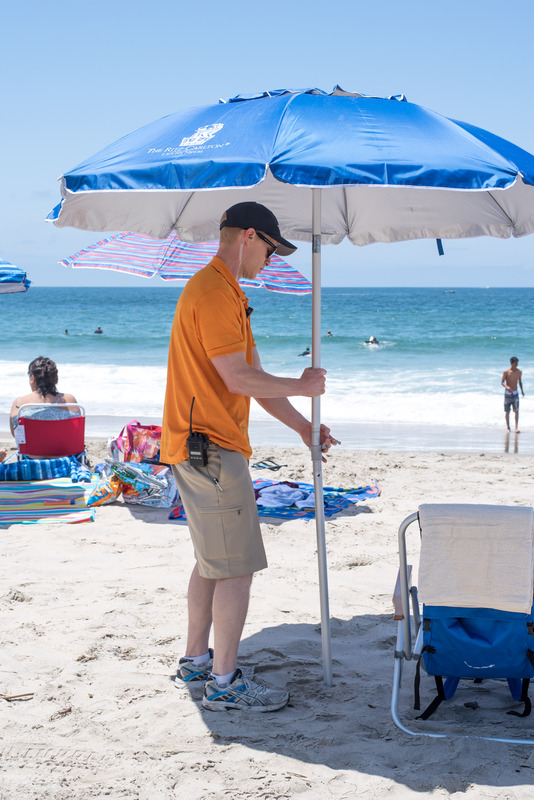 This service is totally included in your daily resort fee, and they’ll retrieve your chairs and umbrellas at the end of the day. If you’re not game for the short but steep trek back to the resort, the Ritz shuttle (an extended golf cart) will drive you back up! You have a choice of two different pool areas, both in interior courtyards. They have a lot of seating, but it fills up quickly on a warm weekend. 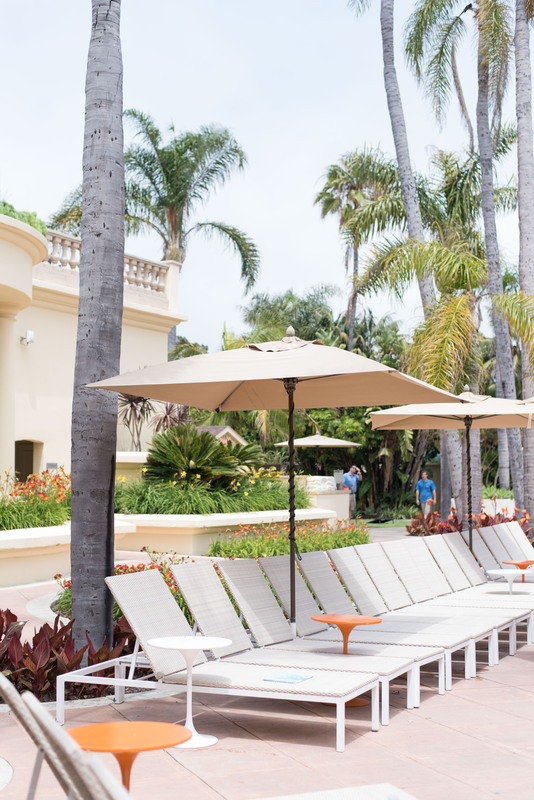 Both pools offer towel service and poolside menus, and the larger pool has a separate seating area for the Dana Pool Cafe. 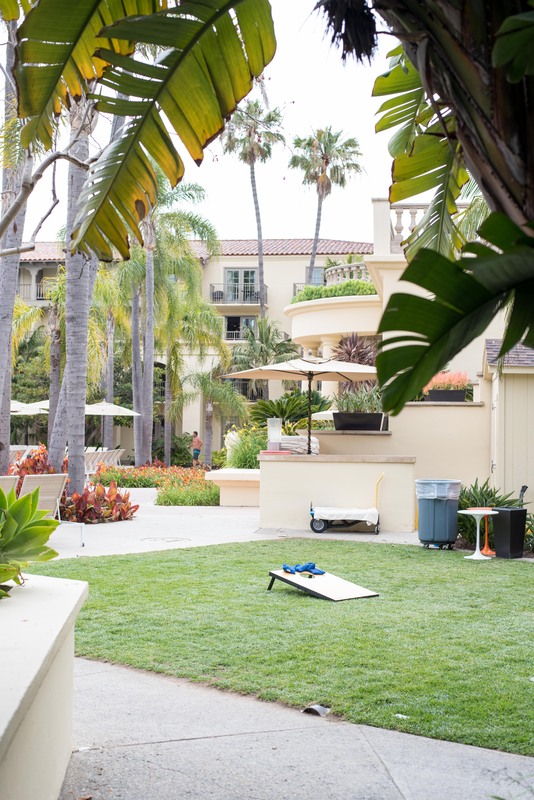 You can also find corn hole, ping pong, and a jacuzzi adjacent to the big pool. 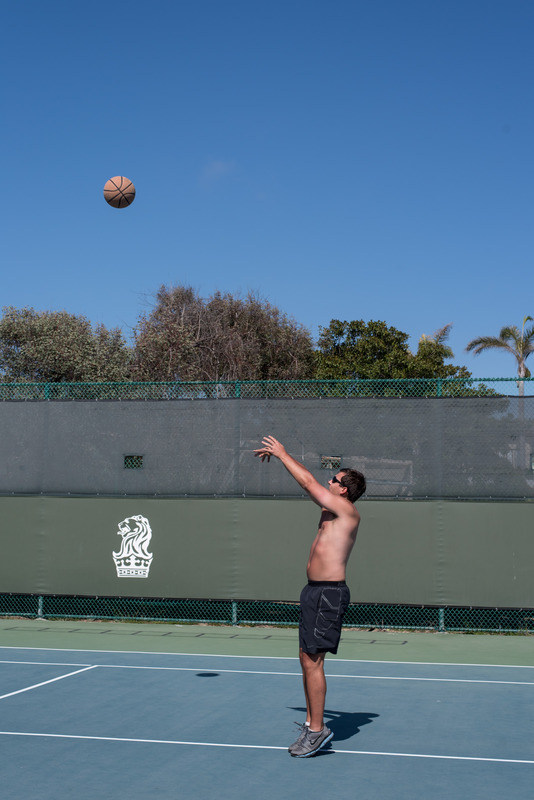 Another fun way to get active is at the tennis and basketball courts. 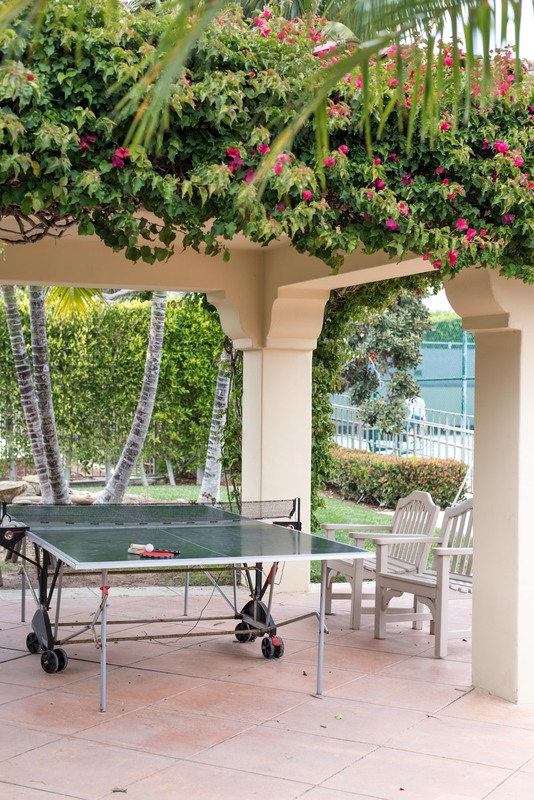 The resort supplies basketballs, tennis racquets, and tennis balls at the courts. The tennis courts can be reserved, though we found no need to do that, even on a holiday weekend. The treatments at the onsite spa are probably every bit as expensive as you’d expect at a Ritz-Carlton, but the daily resort fee covers use of the steam room and spa facilities for all adult guests. 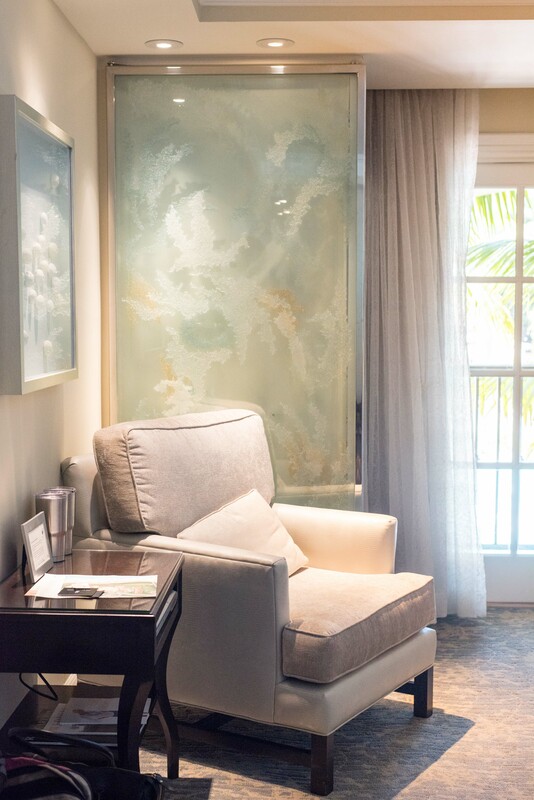 Even if you don’t indulge in a treatment, you can enjoy the steam room, waterfall showers with house-made salt scrub, and the relaxation room. The resort’s fitness center has one of the best views I’ve ever seen from a hotel gym. 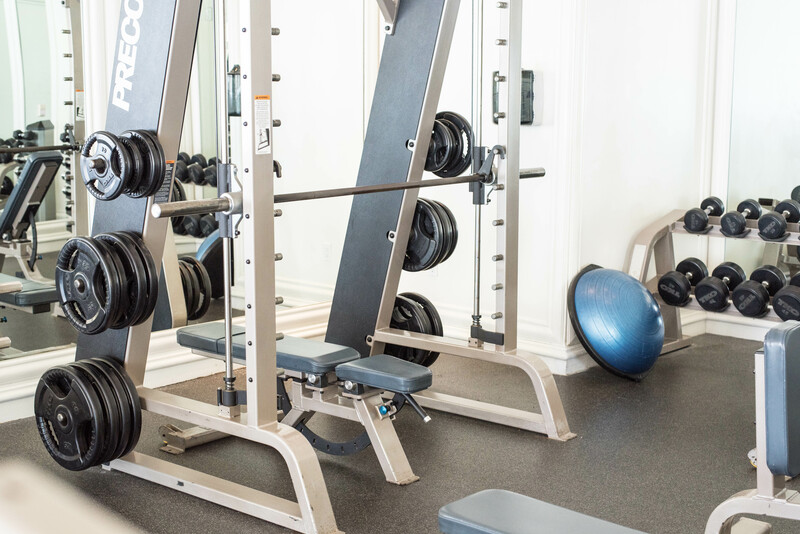 It’s also remarkably well outfitted for a hotel gym. 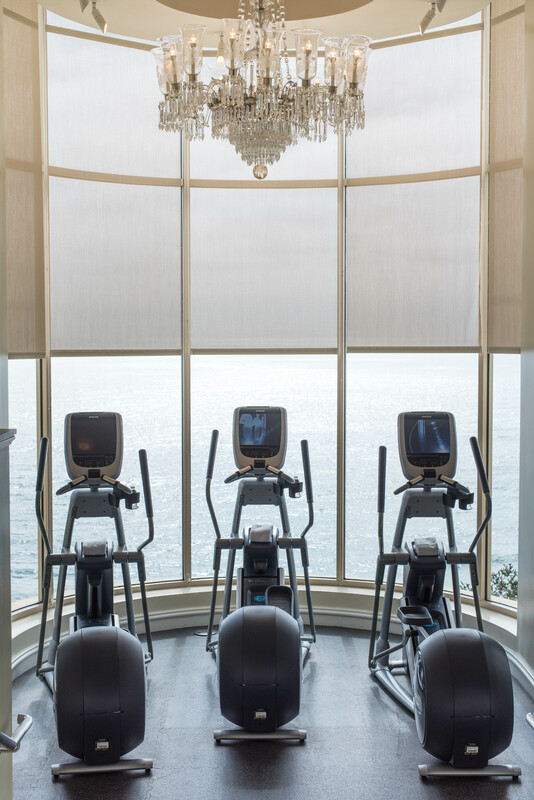 The cardio equipment faces floor-to-ceiling windows overlooking the surf. The rest of the space is filled with machines, free weights, mats, kettlebells, and swiss balls. 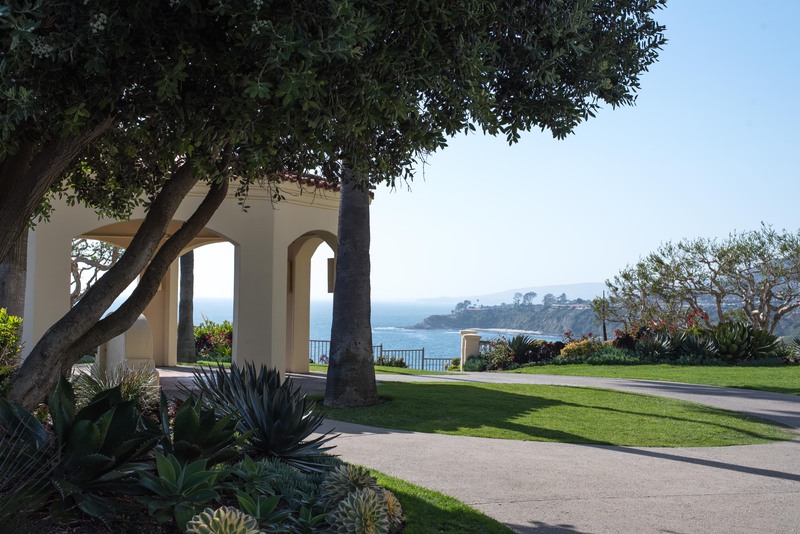 Two daily classes are offered at the oceanview gazebo: yoga (9am) and pilates (10am). These classes are offered complimentary to guests (aka they’re included in your $40/day resort fee). 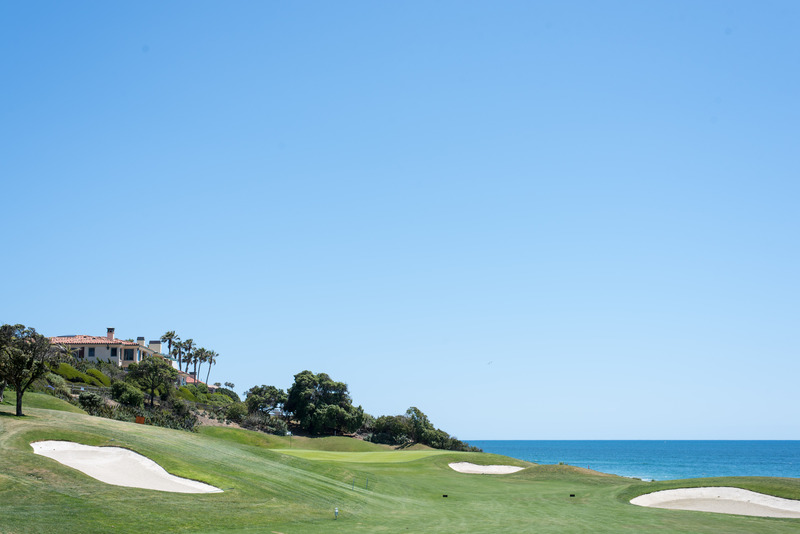 If golf is on your to-do list, you only need to go as far as next door to the Monarch Beach Golf Links, a Robert Trent Jones, Jr. design. The course is beautifully maintained, fun but challenging, and boasts some gorgeous sea views. 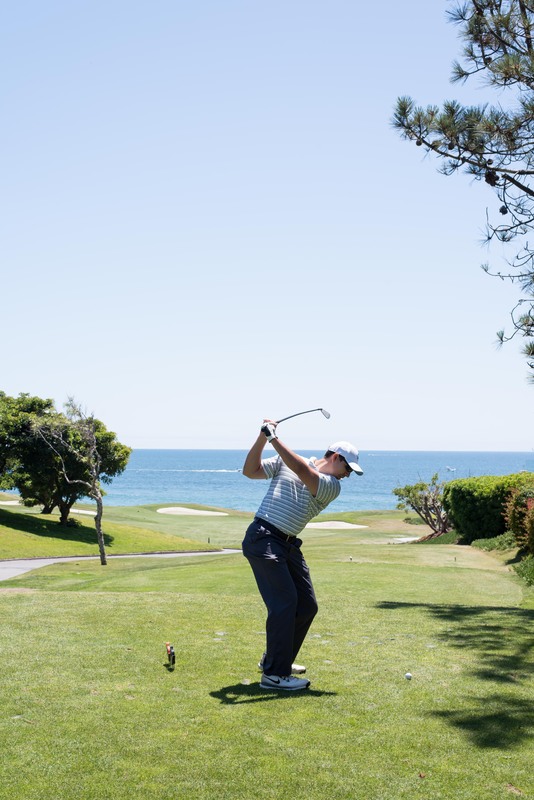 The Ritz has preferred tee times at Monarch Beach and offers a free shuttle to the course. 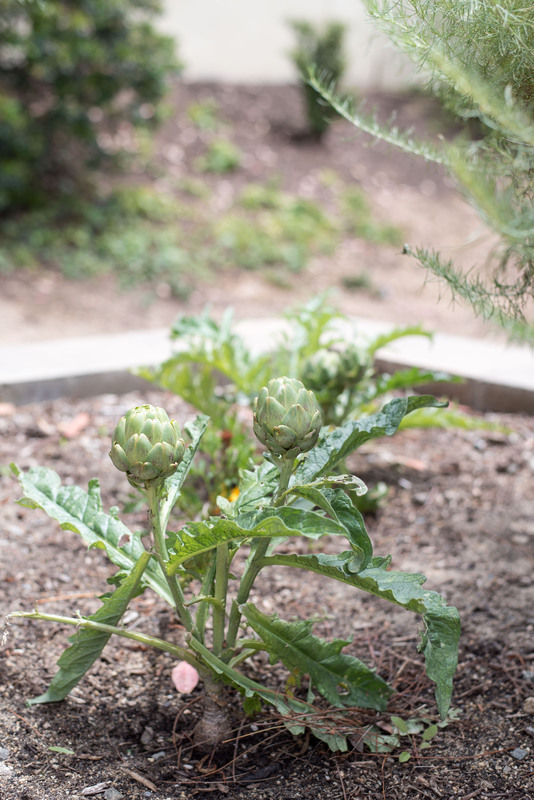 Every morning, there’s a guided tour of the resort’s organic garden used by the resort chefs. 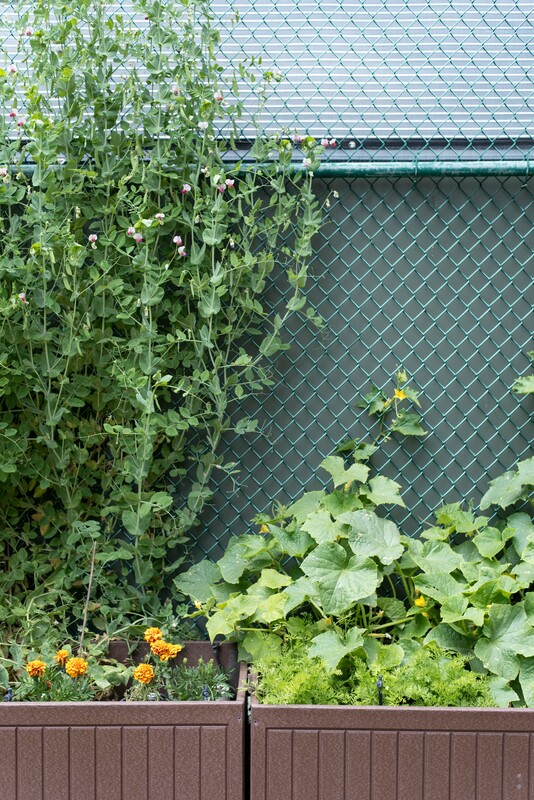 You’ll learn about a variety of herbs, fruits, and vegetables that garnish the plates served at the hotel. The garden is situated between the main pool and the sports courts, and it is accessible all day if you don’t want to get up for the tour. 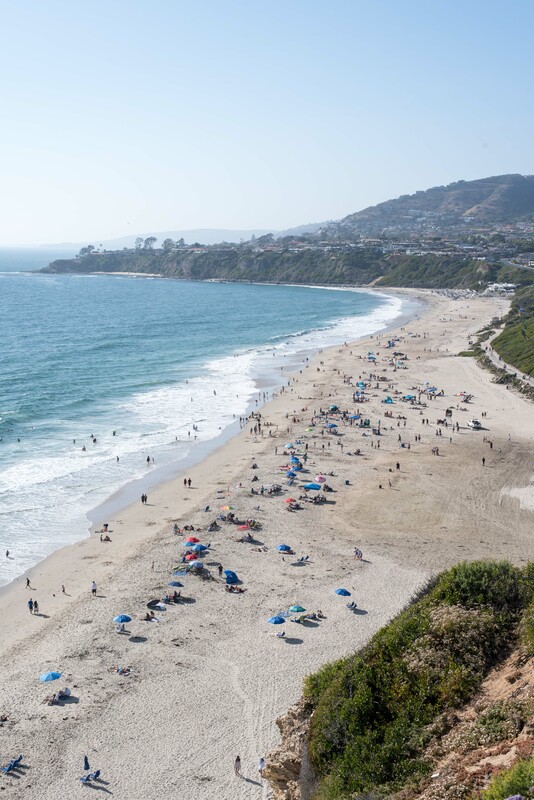 If you don’t want to stay onsite, there’s surfing, whale watching, day trips to Catalina Island, and so much more in the area! This is a Tier 4 Ritz property, which requires 60,000 Marriott points per night for a standard room. Currently you can convert SPG points to Marriott points at a 1:3 ratio, so it costs 20,000 Starwood points per night. You can also sign up for the Ritz-Carlton credit card, which has signup bonus of two Tier 1-4 nights. 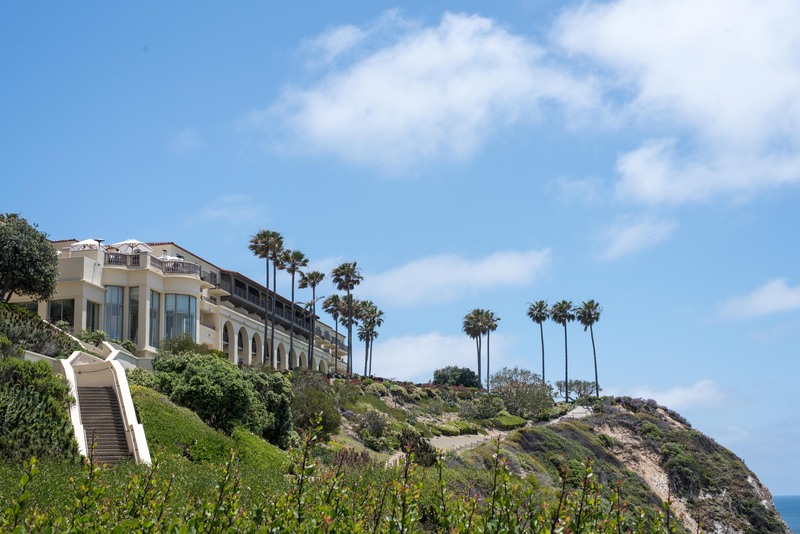 It’s hard not to love a luxury resort sitting atop a 150 ft. bluff over the Pacific Ocean. A wide variety of onsite activities kept us entertained when we wanted entertainment, but there were just as many opportunities to relax. We were impressed with the quality of food, and there were plenty of dining options to keep things interesting for a long weekend. 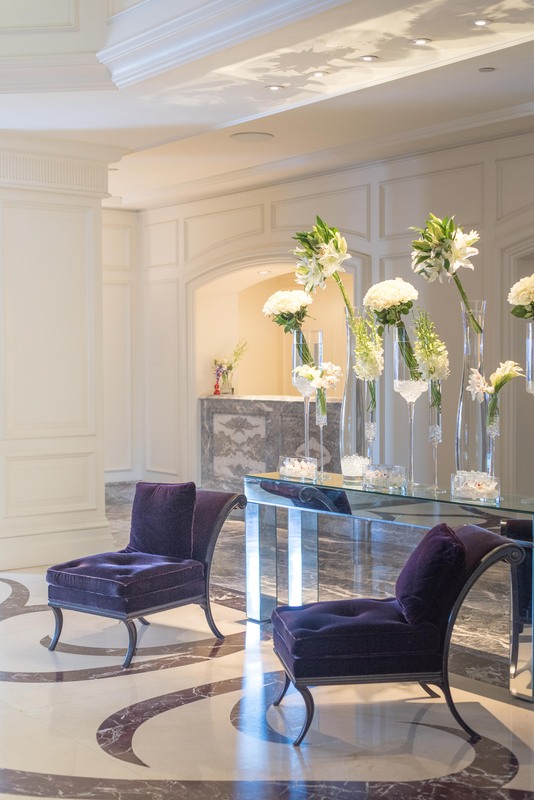 Every space inside the resort is beautifully decorated and maintained, and the lobby flowers are nothing short of an art installation! 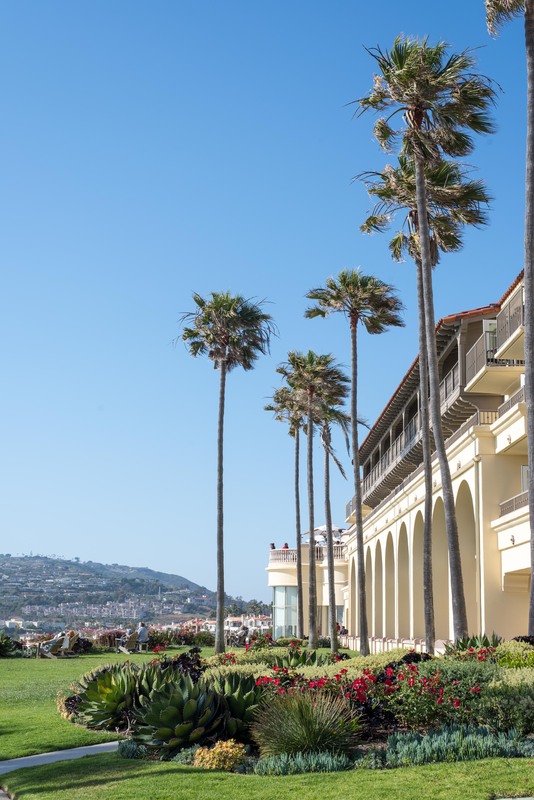 The lush grounds and incredible ocean views outside are just as beautiful as the interior, leaving me starry eyed and inspired the whole time. The proverbial cherry on top, however, was the thoughtful and meticulous Ritz-Carlton service. It totally lived up to the hype! We traveled as a couple in May 2017.